Uphill skiing is the best way to enjoy Colorado snow come spring, SO here we give you the best places to head up and out whether you are at your favorite resort or gunning for the top of the state. It’s 8:20 a.m. on a Monday, and a line is forming at Loveland’s Lift 1, skiers and snowboarders are psyched for first tracks in Sunday night’s dusting. But a handful of intrepid skiers who set their alarms a bit earlier will be shushing down the slopes just as lifts open, having skinned up green runs to the top of Lift 2 before it started running. Are you jealous yet? Don’t be. Read on. Colorado ski areas are getting wise to the growing popularity of skiing uphill, some offering free uphill passes and others offering majorly discounted rates for uphill access to their groomed and—generally—avy-free terrain. A morning lap at your local hill isn’t the only way to get into uphilling, though. Here, we present Colorado’s best ways to earn your turns this spring. 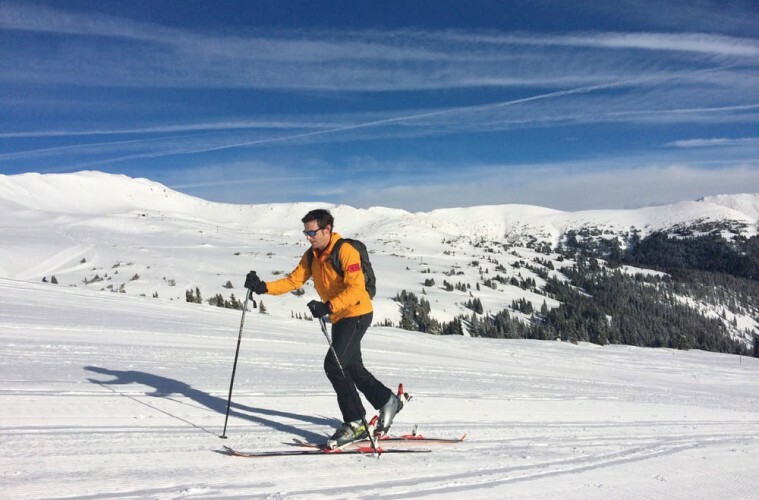 Just an hour away from downtown Denver, a quick lap up to Loveland Ski Area’s Ptarmigan Roost might be the best reason to show up late for work. Check in at the season pass office for an uphill access card, free and good for the whole season. Two access routes are open to uphillers, even during lift hours, as long as the warning lights for the winch cat or snow safety activities aren’t flashing at the bottom of the hill. The icing on top? Dogs under voice command are allowed at Loveland Basin before and after open hours. Just a few minutes past Loveland, Arapahoe Basin also offers free uphill access passes and a similar policy to Loveland. And those few extra minutes of driving put you 8 miles—up and over Loveland Pass—from the sight, sound and stress of I-70. A-Basin posts its decision whether or not uphill access will be allowed for the day on its website by 6 a.m. each morning. If you’re ready to leave the groomers behind, but cautious about high-angle lines, head to Butler Gulch. Turn off Highway 40 onto Henderson Mine Road at the first switchback toward Berthoud Pass, and ski from the large lot at Jones Pass Road. A three-mile tour gaining a tad over 1,000 vertical feet serves up delicious bowl skiing, if avalanche conditions are moderate to low. For mellow lines—but also the potential for accessing steeper, more serious descents—head up from Rocky Mountain National Park’s Bear Lake Trailhead. The East Face of Flattop Mountain, also known as the Banana Bowls, offers low-angle, open slopes. The views of Tyndall Glacier and Corral Couloir will have you lusting for more. As laid back as the Banana Bowls may seem, though, conditions can vary and solid avy knowledge is a must. Quandary Peak (14,265 feet) is one of Colorado’s most accessible 14ers for skiing. In early spring, it’s often possible to ski the entire popular east face and east ridge for a 2,000-foot, mile-and-a-half descent. Not a bad reward for the lung-torching ascent that starts at Quandary Peak Trailhead’s 11,100-foot elevation and gains 3,200 feet. Refresh your skills and check in with the Colorado Avalanche Information Center before heading out. It’s one thing to ski uphill—it’s another thing to try to be fast. If you’re feeling the need for speed, Aspen’s 2015 America’s Uphill race on March 14 is the perfect way to test your mettle. The race is divided into four categories with options for everything from running shoes and snowshoes to cross country skis to telemark. The course climbs 3,267 feet to finish at the Sundeck Restaurant, and the first 275 participants to pick up their goody bags snag t-shirts. You don’t need a full Lycra randonnée skin suit to get into uphill skiing at a resort, but you’ll want to leave your bulky resort parka at home. Start with a wicking base layer: Synthetic or wool base layers will wick sweat away from your body and help keep you from feeling chilled. Add a breathable soft shell jacket and pants: You’ll want to feel a little bit cold when you start because soon you’ll be warm and sweaty from exertion. In a breathable shell layer you won’t overheat. Pack some insulation: Don’t forget to pack along an insulating jacket to slide into while you’re ripping your skins off at the top of the mountain (and for the descent). It only takes a windy minute to go from warm and sweaty to chilled. Stash a hard shell just in case: A waterproof shell stashed in the bottom of your pack will keep you dry if a storm rolls in. It never hurts to be prepared. DON’T Forget the gloves: Thinner soft-shell gloves will keep you from overheating on the way up, but pack a dry pair of alpine style gloves for the descent.